The ability of atmospheric general circulation models (AGCMs), that are forced with observed sea surface temperatures (SSTs), to simulate the Indian monsoon rainfall (IMR) variability on interannual to decadal timescales is analyzed in a multimodel intercomparison. The multimodel ensemble has been performed within the CLIVAR International “Climate of the 20th Century” (C20C) Project. 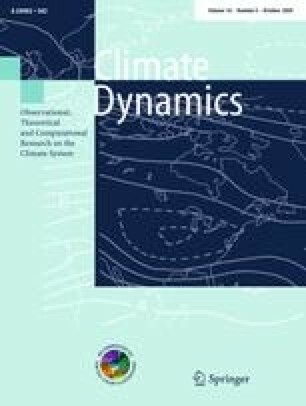 This paper is part of a C20C intercomparison of key climate time series. Whereas on the interannual timescale there is modest skill in reproducing the observed IMR variability, on decadal timescale the skill is much larger. It is shown that the decadal IMR variability is largely forced, most likely by tropical sea surface temperatures (SSTs), but as well by extratropical and especially Atlantic Multidecadal Oscillation (AMO) related SSTs. In particular there has been a decrease from the late 1950s to the 1990s that corresponds to a general warming of tropical SSTs. Using a selection of control integrations from the World Climate Research Programme’s (WCRP’s) Coupled Model Intercomparison Project phase 3 (CMIP3), it is shown that the increase of greenhouse gases (GHG) in the twentieth century has not significantly contributed to the observed decadal IMR variability. A. Scaife and C. Folland were supported by the Defra and MoD Integrated Climate Programme—GA01101, CBC/2B/0417_Annex C5. J. Kinter and E. K. Jin were supported by research grants from NSF (0332910), NOAA (NA04OAR4310034) and NASA (NNG04GG46G). The MGO participation (P. Sporyshev) was supported by the Russian Foundation for Basic Research. T. Zhou was supported by the National Basic Research Program of China under grant number 2006CB403603. J. Kröger and F. Kucharski were partially supported by the ENSEMBLES project funded by the European Commissions 6th Framework Programme, Contract GOCE-CT-2003-505539. We wish to thank Xunqiang Bi (ICTP) for preparing the CMIP3 data and the two anonymous reviewers for their constructive comments that helped to improve the manuscript.